Leaf diseases are very important in tea production since the plants are grown for their young leaves. The major foliar disease of tea in Asia is blister blight. Wind-borne spores germinate on the leaf in humid conditions and the leaf is penetrated. Further growth presses out and eventually a blister is formed on the leaf. Each blister can produce up to 20 million spores. Tea prepared from blistered leaves is weak, with poor color, aroma, brightness, and briskness. 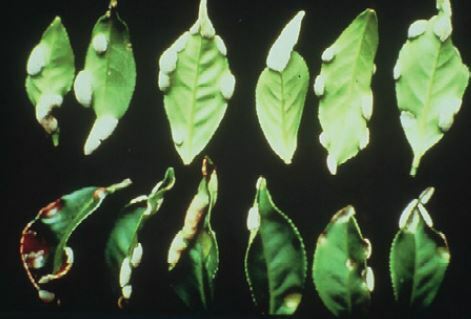 Before the use of fungicides, tea losses to blister blight were staggering with 30-50% losses. Preventive copper sprays have been the mainstay of tea production for the past 60 years. Blister blight is not a problem for organic tea growers since they are permitted the use of copper sprays. Authors: Sowndhararajan, K., et al. Affiliations: School of Life Sciences, India. Title: Integrated control of blister blight disease in tea using the biocontrol agent Ochrobactrum anthropi strain BMO-111 with chemical fungicides. Source: Journal of Applied Microbiology. 2013. 114:1491-1499. This entry was posted in Fungicides and tagged foliar diseases, Fungal Blisters, fungicides, Leaf Diseases, Tea Leaves, Tea Production by pesticide guy. Bookmark the permalink.